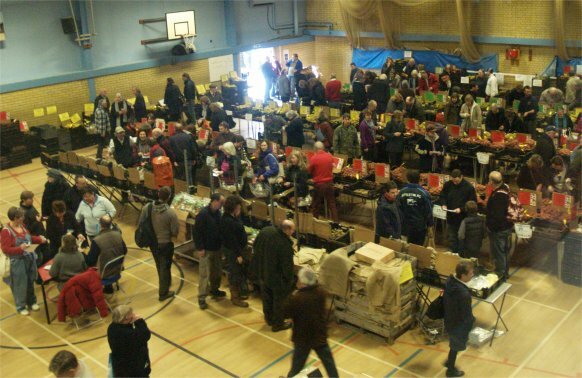 The weekend of 29 - 30th January saw well over 2,000 visitors to Whitchurch’s 13th Potato Day. On Saturday a record of over 1,300 came to the event and over 800 on Sunday made the total very similar to last year’s 2,200. It was great to many families came along and the children all received a free Smile potato, thanks to the generosity of David Higgins, which were distributed with lots of advice by expert 'Taffy Tattie', Dave Chappel. In addition to the 150 varieties of potatoes (even though 17 were stuck in France thanks to strikes) there was wide range of peas and beans, onions and shallots all from Charlton Park Garden Centre. Beans and Herbs, Thomas Etty Esq & Pennard Plants were offering heritage and unusual seeds. Plants, including many not seen elsewhere, came from Pennard Plants and Edulis. Closer to home, Tufton Smallholding and Overton Plants supplied bulbs and perennials. New this year were Grow your own cards and the Facing Heaven Chilli Company, the latter providing tartiflette to ward off hunger. Boothmans Agriculture came all the way from Lincolnshire with its brand new product to kill mare’s tail and from the Midlands came Implementations' copper tools. 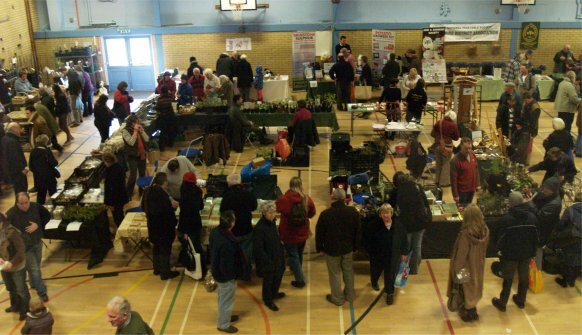 The seed swap was organised again by Hampshire Organic Gardening Group (HOGG). Refreshments were provided by the White Hart and Caroline and Callum Johnson did a roaring trade with home made cakes in aid of the Mityana Project. Advice on vegetable growing in general was freely available from the Hampshire Branch of the NVS. The whole event would not have been possible without the help of helpers from HOGG, the Friends of Whitchurch Primary School, who provided a myriad of children’s activities, and supporters of Whitchurch Parish Hall. The days would not have been complete without talks from Chris Bird of Sparsholt College.